Michael Lage joined the military straight out of high school wanting to see the world and follow the legacy of his relatives who also served. He deployed to Iraq three times as an Infantryman in the Army. On June 20, 2007, during his third tour, Staff Sergeant Lage was on a night raid with the 1st Battalion, 64th Armor Regiment in Baghdad, when his vehicle struck an improvised explosive device (IED). SSG Lage was the only survivor. After the incident, he underwent a life-saving splenectomy before being transported to Germany and then the United States. His injuries included severe facial burns and the eventual loss of his left hand and right thumb. Since his injury, Michael has endured more than 100 surgeries including major facial reconstruction. During his stay at Brooke Army Medical Center, Michael met his now wife, April, who was also recovering from service-related injuries. The two became support for one another and formed a relationship. “She was a light for me when I was full of darkness,” Michael says about his wife. 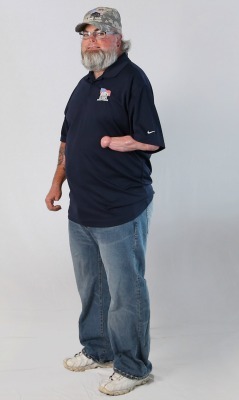 After working as a patient representative with the Wounded Warrior Unit at Fort Sam Houston, Michael retired. He and April love cycling together, something they find physically and mentally therapeutic. The two also volunteer with several nonprofits including Operation Comfort, Wishes for Our Heroes, Project Hero, CAMO Estes, and Chive. Michael says having a specially adapted custom Homes For Our Troops home will allow him to explore the outdoors and volunteer more. In his current home, it is difficult for Michael to open doors. He has severe burns on his limbs and April has leg injuries too, so using the stairs is challenging for both of them. In a single-level HFOT home with automatic doors, these issues will be resolved for Michael and April. Michael will also be able to sleep and breathe more easily in a home with efficient air conditioning and an air purifier. The financial freedom of not having a mortgage will give them the opportunity to pay off debt and help their children with college. Michael and April are choosing to build their home in the San Antonio area where they live now, because of the community and connections they have made there. Community Kickoff held on Nov. 10, 2018.